A coolant temperature sensor is especially important for the optimal performance of your vehicle. While you drive your vehicle, the engine goes through continuous combustion. This can make it very hot during the drive, especially during the daytime drive. To keep the engine cool, there is always a mechanism used in each vehicle to keep it cool usually by passing different fluids and liquids through the engine to keep it cool. You may already know that overheating can affect the performance of your engine and too much heating can eventually make the engine seize or break down. To keep things cool, the water in the radiator is passed through the pipes to maintain the temperature. The engine oils are also specially designed to ensure the minimum heat production while your engine runs. That is why it is important to regularly check and fill the water in the radiator through the opening present under the hood of your vehicle. Like every other component, the ECT sensor can also get damaged resulting in a number of engine-related problems. Hence, it is advised to have your car inspected right away to avoid any serious problem. Here are some of the common symptoms you might face if the ECT gets damaged or becomes faulty. Common symptoms of a bad engine coolant sensors are overheating, hard starting conditions, poor idle, check engine light ON and the electric fans do not work properly. The easiest way is to read the trouble code memory and check the value from the sensor, to make sure it’s a possible value. A faulty ECT sensor can send a false signal to the onboard computer resulting in an incorrect fuel pressure regulation. For example, a faulty sensor can send a signal indicating the engine is cold when it is not and as a result, more fuel will be used to heat up the engine fast. This will cause the fuel economy to drop and decrease the engine’s performance. One of the first symptoms you will notice is that the check engine light will activate. If the computer detects any problem with the sensor’s circuit, it will illuminate the check engine light indicating that the car needs inspection. Due to an incorrect temperature signal, the ECU may enrich the fuel mixture to a point where the combustion process becomes difficult. The excessive fuel will burn in the exhaust pipe and will produce a thick black smoke. The cooling fan which is behind the radiator grille removes heat from the engine’s coolant. This fan is electrically controlled and relies on the signal from the onboard computer. If the fan receives a false signal, the fan might not turn on causing the engine to overheat. Some vehicles can have a separate coolant temperature sensor for the fan, but a lot of cars use the same sensor. Due to a faulty ECT sensor, the fuel mixture will adjust accordingly. This will cause the engine to vibrate or shake when the car is at low speed and give other power losses and strange behaviours. 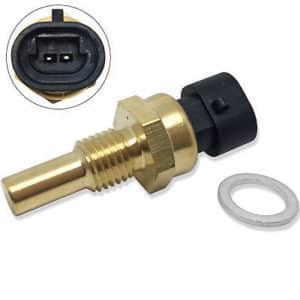 Coolant temperature sensors are also known as engine coolant temperature sensors or ECT sensors. The principle working of this sensor involves the use of an electrical resistance which measures the temperature of the coolant. These measurements produce essential data for the engine system of your vehicle. The readings produced from the coolant temperature sensor are transmitted to the engine control unit, where it is utilized as data for regulating and maintaining the proper ignition time and the optimal fuel injection through thecomputerized approach. It is usually placed on the right side of your vehicle adjacent to the radiator. The heat produced as the energy waste due to fuel burning is regulated by the coolant that we use in our vehicle. The coolant temperature sensor plays an important role in monitoring the performance of the coolant and takes measurements of the temperature. It can help the control unit in your engine system to detect when the coolant is not functioning well and your vehicle is overheating. Hence, the coolant temperature sensor carries out its primary function of alerting the engine system when the temperatures are beyond the standard limits which may damage your vehicle. The ECT sensor is usually located somewhere near the engine thermostat. The sensor measures the temperature provided by the thermostat as well as the coolant itself. The recorded temperature is then sent to the ECU which then adjusts the engine functions accordingly. The onboard computer also opens and shuts down the cooling fan depending on the temperature reading and controls exhaust gas recirculation and fuel combustion process as well. How to diagnose a faulty engine coolant temperature sensor? When your check engine light is on, the best way is to start with reading the trouble code memory. You can do it at home if you have an OBD2 scanner. If you do not have one at home, but want one, you can check out our review article about the best OBD2 code scanners. Check it out here. With a good OBD2 code reader, you can also check the live data and the parameters of the CTS sensor. Check that the temperature value of the CTS is around 80-90c when the engine is hot. A lot of engine coolant temperature sensors have two wires and the sensor is controlled by Ohm. Get a wiring diagram and get what ohms you should have at a specific temperature to check the function. You can use a Digital multimeter. to check the Ohm between the pins. Locate the coolant temperature sensor in your vehicle by referring to the service manual. Connect the digital multi-meter to the coolant temperature sensor by connecting the red probe to the terminal end of the coolant temperature sensor and the black probe to the solid grounding. Start the engine and let it run for a couple of minutes at least. Find the difference between the maximum reading while the engine was hot and the minimum reading while the engine was cold. See if the difference between the hot engine reading and the cold engine reading is more than 200 ohms. If the readings are not more than 200 ohms your coolant temperature sensor has gone bad. Typically, the coolant temperature sensor will be located in the coolant pipe. In most vehicles, this is present behind the right cylinder head below the air intake pipe. Different brands and car manufacturers have a different way to place the coolant temperature sensor depending on the car design. Generally, it is located closely within the proximal area or inside of the thermostat off the cooling system of your vehicle. 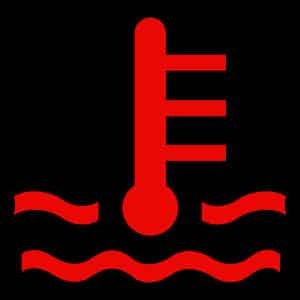 Some vehicles may have more than one temperature sensors, as sometimes different sensors are used to send the signals to the dashboard and the control unit of your engine system. This is optional and a manufacturer can use only one coolant temperature sensor to send the signals to both of these desired receivers. In the case of two sensors, we usually consider the one sending signals to the control unit as the coolant temperature sensor. The Engine Coolant Temperature Sensor can last a long time if it is properly maintained. Here are a few tips which will help your engine stay in good condition and avoid problems associated with the ECT. A lot of people make this mistake of filling the radiator with regular tap water. The tap water has elements of rust and other minerals in it which can be harmful to the engine in the long run, especially if the water begins to boil and evaporate inside the radiator. Always use a coolant as it provides proper lubrication and prevents rust formation. If there is a leak in the engine bay and the oil enters the engine block, the coolant will get contaminated causing a problem to the ECT sensor. The coolant system of the car does not need constant refilling. However, if the coolant level is dropping frequently, there might be a leak and should be fixed immediately. With inadequate coolant in the reservoir, the ECT sensor might give a false reading to the ECU. The ECT sensor is located near the radiator usually down inside the engine bay. 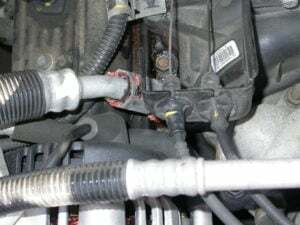 Once you locate the ECT sensor, disconnect the connector cable which connects the sensor to the ECU. Unscrew the ECT sensor in an anticlockwise direction similar to how a spark plug is removed. Install the new sensor and reconnect the connector cable. The average replacement cost of the Coolant Temperature Sensor is between $100 and $220. The labour cost is between $40 and $140 while the part itself cost between $50 and $80. The coolant temperature sensor is relatively less expensive compared to many other sensors installed in your vehicle. On average for most vehicles, the cost for the parts involved in the replacement of the coolant temperature sensor was from $55 to $80. However, the lower end of the coolant temperature sensor price was as little as $36, while the higher end of the coolant temperature sensor parts price was as much as $90. It is important to note that the price can get higher than this in case of luxury vehicles. The average labor cost involved in the replacement of the coolant temperature sensor is anywhere between $40 and $140. However, it is a highly variable factor, and the labor cost in certain cases can be higher than $140. It is a good idea to get different quotes, do a market research and bargain for the just and right price of the work with the mechanic if you are trying to save up on the cost involved in it. Otherwise, you may also try to go for a do it yourself replacement as it is relatively easier and simple as described in our guide. Here is a step by step procedure to replace the coolant temperature sensor of your vehicle. Remember that all car models are different, and this is just a general guide of how to do it. • Get the tools that you may need and get the protective wears. • Make sure that your vehicle is parked on the straight flat level surface. • For clearance and reaching out jack the front end of your vehicle to lift it. • Remove all the electrical connectors from the temperature sensor after locating all of them. • Remove the coolant temperature sensor from where it is mounted. • Clean the hole where the sensor is located in order to remove any interference. • Connect all the electrical connections back from where you took them off. • Make sure once again that you have tightly plugged in the drain plug of the radiator. • Add the coolant in your radiator from the radiator opening. • Dispose of the previously used coolant that you drained out. • Remove the jack stand from the front end fo your vehicle. • Start the engine and warm it up. • Verify if the low coolant indicator light is on. • Check the coolant once again after 1 hour of drive and fill it back up to the mark if it goes down. Honda Civic 1996-my radiator fan automatically run when i ON my start. whats the probable cause?